The 3D software market has never been in as much turmoil as it is right now. But this isn't meant to sound like a bad thing—quite the contrary. There was a time when CAD jockeys stuck to only in one 3D software package and would snub their nose down at anyone else that used any other software. In today's design studios, any designer worth their salt will tell you that they use at least two to four different software packages in the design/engineering process. A seasoned vet will always say that no one programs offers everything that a design engineer might need on any given day. Fast forward to today and take a look at relatively new old comer to the scene from a company called Solidthinking and their suite of Design Software Solutions called Inspire and Evolve. The software can best be described as yin and yang: the former "enables design engineers, product designers, and architects to create and investigate structurally efficient concepts quickly and easily" and one that "allows industrial designers to develop forms faster and to capture an initial sketch, explore styling alternatives and visualize products." - It's a parametric based system that has a ton of flexibility. It's ability to "swap out" any 2D sketch entity for another and not break downstream features adds a level functionality that opens up new possibilities. - It runs natively on both Mac and PC hardware. 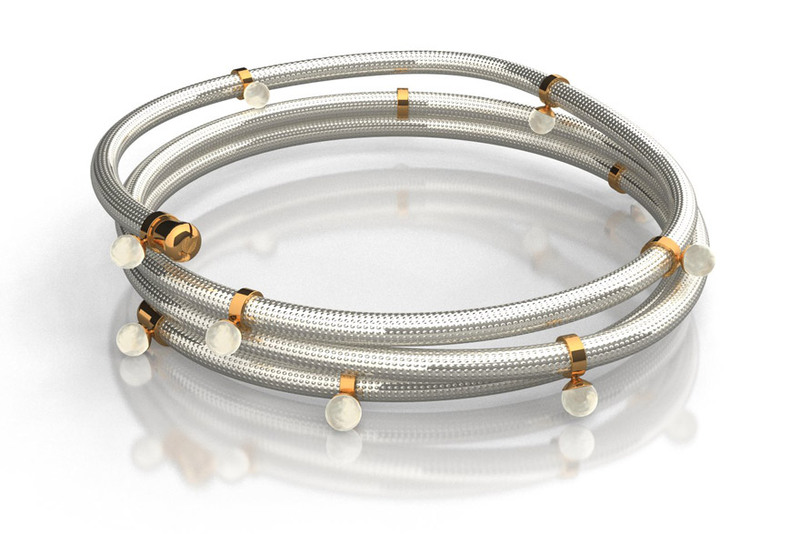 - One of the most amazing, yet so simple, is the ability to continue a spline. This is huge: users don't have to worry about deleting and starting over but can simply choose to pick the last point of a spline and then based on the next mouse click and continue going as if that's what you initially did. - Besides the standard NURBS modeling approach, Evolve also offers two additional ways to explore or to be inspired. The first is through subdivisional modeling, which gives a fundamentally different approach to geometry creation, as it is more of a direct editing of surfaces rather than through "wireframe." - Inspire takes any existing 3D geometry and based upon forces, loads, etc. placed on faces/edges by the user will cause organic "bone" like geometry to form in place of the model. 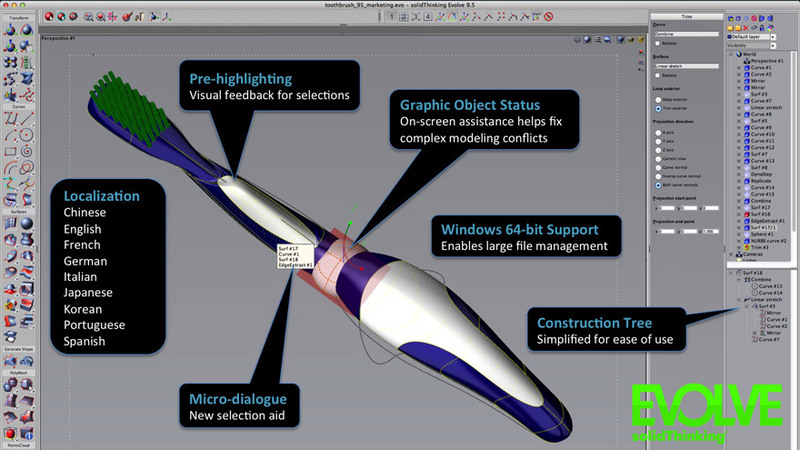 From there the augmented model can be used as a reference towards creating a new design. At this point, adjustments can be made to optimize the amount of material that's been "subtracted." As with most standard 3D software packages, Evolve offers a fully integrated realistic rendering package that generates in real time. The variety of options includes "scanline, ray-tracing, and hybrid rendering for the integration of radiosity with ray-tracing." This offers a wide range of possibilities that other packages would require theses same effects to be added in post-production effects to be added in something like Photoshop. - Evolve sits dead center between Solidworks, Rhino and Modo. - Its "construction tree" system is both great to have and challenging to navigate at times. A program like Solidworks and its feature manager tree is pretty straightforward in that everything appears linearly down the left side, where Evolve's construction tree can branch out, much like folders in Windows Explorer, to find the feature/sketch needed. - There is also no separate assembly and drawing environment but it is completely possible to create a "multi-body" design with drawings that tie to it. - The option to run native on a Mac in OSX makes it much more appealing than Rhino, which is still in beta, and offers a depth of surfacing capabilities one would expect from a serious design/engineering software. - Evolve offers both NURBS and SubD modeling natively, but there are also good reasons for keeping them separate in traditional packages... in some ways, it comes down to simple data conversion. 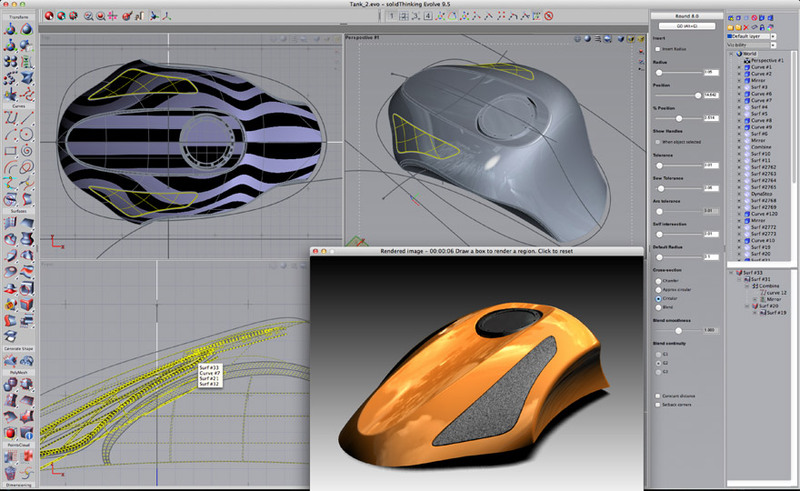 Solidthinking's approach is to take the NURBS geometry and switch the data to SubD. If you're more familiar with Modo or polygonal modeling, this is where you'll start to feel right at home. The newest iterations of Inspire and Evolve include a whole new suite of features that definitely brings some refreshing design tools to the table. It's worth downloading a trial version if only to take it out for a test spin and while it won't replace any of your existing software packages and it's flexibility allows for it to be placed in either the front or back end of the design pipeline.